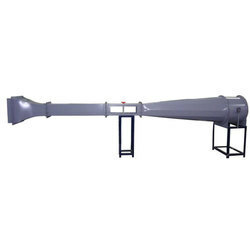 Manufacturer of a wide range of products which include centrifugal blower test rig, wind tunnel and axial fan test rig. Energy measurement Electronic Energy meter, L&T make. RPM measurement Digital RPM Indicator with a Proximity sensor. Instruction Manual An ENGLISH instruction manual will be provided along with the Apparatus. Usage Furnaces, cupolas, mine and air-conditioning plants etc. 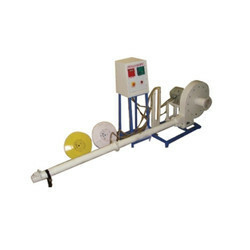 We are offering a wide range of Centrifugal Blower Test Rig. This equipment comprises of an FD Centrifugal Blower coupled to a Motor. Three interchangeable impellers with forwarding, backward and radial vanes are provided with the test rig. A Pitot Tube is provided in the delivery line of the blower for static and dynamic pressure measurement. Power input to the DC Motor is varied by means of a Thyristor controlled DC Drive to vary the RPM of a motor. An RPM Indicator with Proximity sensor indicates the RPM of Blower. AC motor is provided with MCB for overload protection. To find out the discharge, head and efficiency of the Centrifugal Blower. U Tube Manometer Length 500 mm. Wind Tunnel has been developed to perform various experiments of aerodynamics and fluid flow. This is a open circuit Wind Tunnel provides a region of controlled air flow into which models can be fitted at downstream of working section. 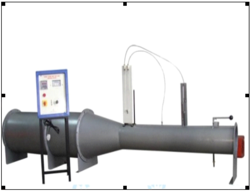 The Tunnel consists of bell mouth shaped entry to guide the air smoothly into settling chamber and stabilizes the air flow this follows working section for test section where various models can be tested. Test section with acrylic sheet, will be provided for visual observation. Working section is followed by diffuser section which reduces the dynamic pressure at the exit. A fan coupled with motor is used to produce desired wind velocity. To plot speed curve for wind tunnel. T study pressure distribution around (A) aerofoil (B) Cylinder (C) Sphere. To measure lift and drag on aerofoil model. To study the development of boundary layer along a plate in Tunnel. This equipment comprises of a Axial Flow Fan coupled to a AC Motor. A Pitot tube is provided in the delivery line of Axial fan for static, dynamic and differential pressure measurement. Looking for “WIND TUNEL EQUIPMENT”?